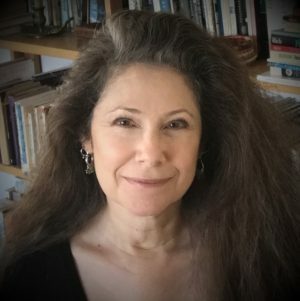 When I was invited to guest blog for Best American Poetry, I immediately thought of a marvelous post on Harriett by John Beer, in which he thoughtfully explores one poem by Carol Ciavonne (a fine poet and Posit contributor, who has recently become one of our associate editors). Beer’s reminder that reading is at the core of what we writers do and love, evokes “a sense of one reader’s process, not a method per se but a set of explorations,” and seems eminently worthy of emulation. Take a look at the efficiency, wit, and depth packed into that incredible opening, which somehow manages to summarize our mortal existence: the passage from breath (life) to oblivion, with no help from any (literal or figurative) ladder, nor hope of a chaser (afterlife). It’s a characteristic Borkhuis line: snappy and funny; inflected by the imagery, lingo, and hard-boiled attitude of noir; brunt and exhilarating in its clarity and directness. This line also establishes the poem’s ekphrastic project: a duality echoed within the painting, with its parallel linear assemblages of black shards crossing a pale field sprinkled with brightly-colored scraps. The very duality of the poem’s project mirrors the image of a ladder even while its explicit language, as well as the painted image itself, dashes any hope of one: consider the absence of any marks resembling rungs connecting the parallel black lines. A rung-less ladder as the best tool available to help us muddle through our lives? It’s a metaphor worthy of Beckett. There’s a bleak humor at work here, reinforced by the horizontality of those black lines, belying any hope of a progress narrative to redeem life’s so-called journey. In the world of this collaboration, there is no ascent; there is only pushing through, “crossing the shatters” in our “sizzle-cage.” In these images from the second line of the poem, Borkhuis draws on theology and physics for resonance and depth, characterizing the body, that earthly vessel, as a pain-filled trap (“sizzle-cage”) from which we can only hope to be liberated once it conveys us across “the shatters:” a resonant description of the painting’s shard-strewn ground, as well as the violently fragmented fabric of matter itself. I’d like to point out just a few more brilliant bits, like the “striptease of body parts” in the second stanza, which carries forward the first stanza’s sexual imagery, highlighting the resemblance of the painting’s strewn and scattered shards to the skimpy bits of clothing cast off in a striptease. Except that this is “striptease of body parts,” connecting the earlier references to death and destruction to those that follow, such as “darkness opens me like a tin can,” “my hand burned down to the wires,” and the “thundering hooves” of the “red rider” (a reference to the Four Horsemen of the Apocalypse). –Originally published in The Best American Poetry blog, October 2017. Susan Lewis is the author of Zoom, winner of the 2017 Washington Prize (The Word Works, 2018), as well as nine other books and chapbooks, most recently Heisenberg’s Salon (BlazeVOX [books], 2017), This Visit (BlazeVOX [books], 2015), How to Be Another (Červená Barva Press, 2014), and State of the Union (Spuyten Duyvil Press, 2014). Lewis received her MFA in Creative Writing from Sarah Lawrence College and her BA and JD from UC Berkeley. She taught creative writing at SUNY, Purchase and has served as an editor and guest editor on several publications.